Here’s a look at what’s in store for our easy paleo dinner tonight. It’s one of the easiest meals to make, but it tastes gourmet, which is why I love it! In fact, it is currently taking care of itself in the kitchen while I type this post. 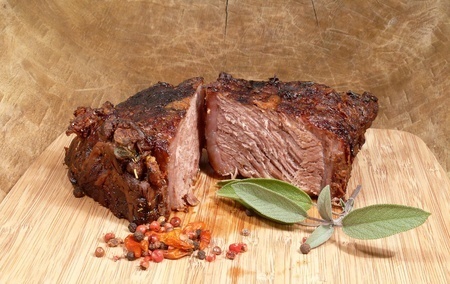 Spice-Rubbed Sirloin Roast – This is one of our favorite recipes of all time. We have probably made it over a dozen times already this year, and my husband asks me to make it more often. To keep things simple, I pre-mix the spices and keep them in a glass jar. When it’s time to get ready for dinner, I dump some in a bowl (just eyeball it), mix in the oil, and then rub on the roast. Bake for 45 minutes to an hour, depending on the size of your roast. Recipe here. While that’s in the oven, I get out my pressure cooker, and make Robb Wolf’s Butternut Squash. It’s not actually a recipe, but a method. Check out this video to learn how to cook butternut squash in the pressure cooker. When it’s finished, I stir in a little coconut milk for creaminess, and season with salt and pepper. And finally, Easy Broccoli, which cooks in the microwave. Tonight I’m using frozen broccoli, and I just dumped a bag in my Pampered Chef Micro-Cooker with a little water, and let it cook for 5 minutes. Then strain, add a hunk of grass-fed butter, and season. Tonight I’ll probably have some watermelon on the side. Happy Summer! So when dinner is ready (the roast still has about 15 minutes to cook, and 15 minutes to rest), I will have spent less than 15 minutes in the kitchen, but I will have a beautiful meal for my husband and myself! Just wanted to share… hope this gives you some ideas on how to keep things simple. Thank you for sharing! I have a roast in the freezer and was looking for something different to do! Even better that it’s super simple!